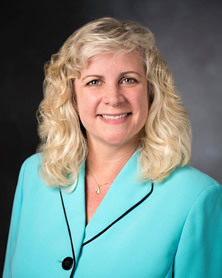 Cindy Galway Buys, acting associate dean for academic affairs in the School of Law, will serve as interim dean of the school following an announcement by Chancellor Carlo Montemagno. Buys’ appointment was effective July 23 and will be final upon SIU Board of Trustee approval in September. Buys takes over for Christopher W. Behan, who was acting law school dean since September 2017. Discussions on details associated with a launching a national search for a permanent dean are beginning, Montemagno said. “I look forward to working with Interim Dean Buys to continue to move the law school forward, especially as we welcome what I believe will be an outstanding class of first year students next month,” Montemagno said in making the announcement. Montemagno also thanked Behan for his work during the 2017-2018 academic year. “He did an excellent job of stewarding the school during a challenging time, and we are grateful for his steady hand and commitment to our students, staff and faculty,” Montemagno said. Buys came to SIU from the U.S. Department of Commerce’s Office of Chief Counsel for Import Administration, where she was an international general attorney. At SIU, Buys has taught numerous courses in a variety of subjects, including international law, constitutional law, immigration law, international human rights and asylum and refugee law. Director of International Law Programs since 2007. Founder and director of Immigration Detention Project since 2005. Co-founder and director of Women in Leadership Workshop since 2010. Co-director and professor, Summer Study Abroad Program in Ireland and Wales (2007-2014). “I am impressed with Professor Buys’ background — both at SIU and prior to her arrival in Carbondale. Her experience in the School of Law and in public and private practice has prepared her well for this role,” Montemagno said. Buys has also held several leadership positions in state and national organizations such as the Illinois State Bar Association, the American Association of Law Schools and the American Society of International Law. Buys earned her law degree from Syracuse University College of Law in 1991, and has a master’s degree in international relations from the university’s Maxwell School of Citizenship and Public Affairs. She earned a bachelor’s degree in political science from the State University of New York at Albany, and has a master of laws degree from Georgetown University Law Center.